The box has a rectangular form, is mounted with silver hinged covers on each side and has on the above and underneath side compartments. The white enamel has been coated on a copper surface. On this white enamel background, there are applied die-stamped gold foil reliefs. 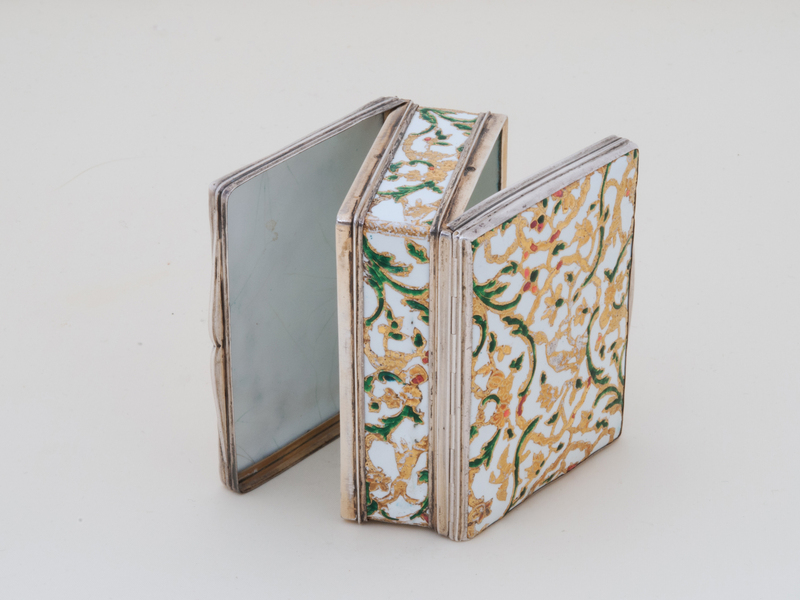 The two hinged covers are thus adorned very richly with naturalistic motives and in a playful way. Between continuous foliate scrolls and flowering branches, there is a fox in the middle, a dog in the lower, right side and a bird on the upper, left side of every cover. It seems as if the dog lurks the fox. The gold foil reliefs are moreover partially infilled with translucent green and red enamel. A golden contour is kept around these. The final effect of this ornamentation is that of the mounting of precious stones. The overall decoration is faithful to the rococo style and it is very beautifully affixed. One could think that this box was taken for the hunt, due to the animal décor it shows. The box is held in a very good condition and has normal traces of usage. French marks are ligated on the inside of the silver mounting. For an almost identical box see in Österreichisches Tabakmuseum, Snuff Boxes oder Von der Sehnsucht nach lüsternen Nase, cat. no. 185. 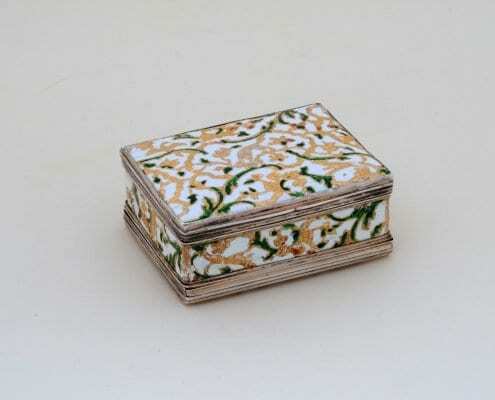 Helga Matzke European Silver shows another enamel snuff box with similar decoration, probably from the same workshop. Boxes, namely snuff boxes, which are decorated like this present one, are usually attributed to the workshop of the Huguenot Pierre Fromery. Pierre Fromery (1655-1738), was an émigré from France, who was active in Berlin as an accomplished clock- and boxmaker, steel-cutter and armourer. After the death of Pierre in 1738, his son Alexander (1695-1775) took over the workshop and activities of his father. Alexander was moreover a dealer in luxury wares, who made since 1733 business with the Meissen Porcelain Manufactory (Holzhausen 1930/31, S. 10). Christian Friedrich Herold (1700-79) worked in the workshop of Fromery, but he joined in 1726 the Meissen Porcelain Manufactory. He then transferred there the technique of the application of gold foils. Besides, Herold has contributed to the development of the refined painting of the Porcelain Manufactory, which he has ennobled and evolved (Holzhausen 1930/31, S. 12). However, he was still active for the Fromery workshop despite the protests of the director of the Manufactory. 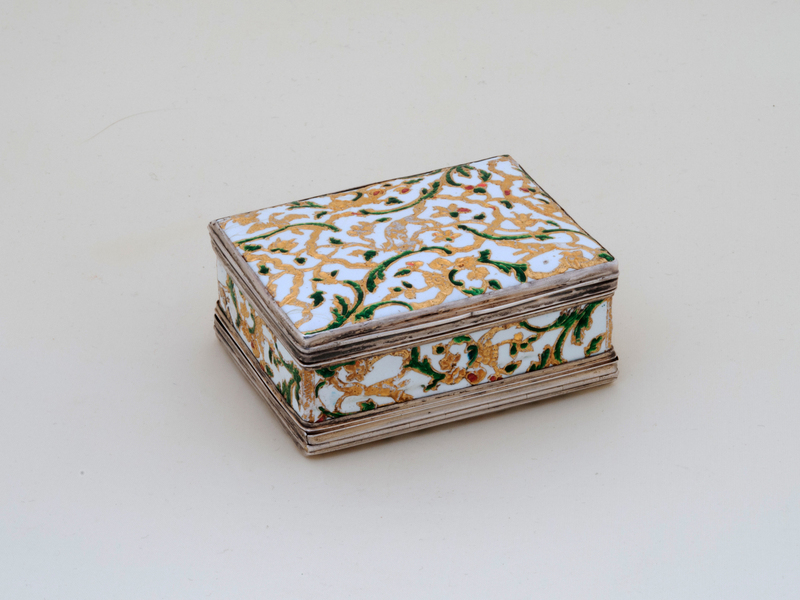 Wares of toilet sets and boxes with white enamel take the name of “email de Saxe”. 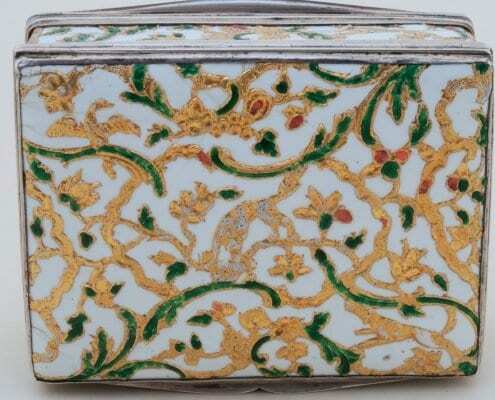 Their chief feature is the gold relief foils and the colourful painting on the white enamel surface. This technique was mostly used in Dresden by Dinglinger, in Berlin by the workshop of Fromery and in Augsburg. 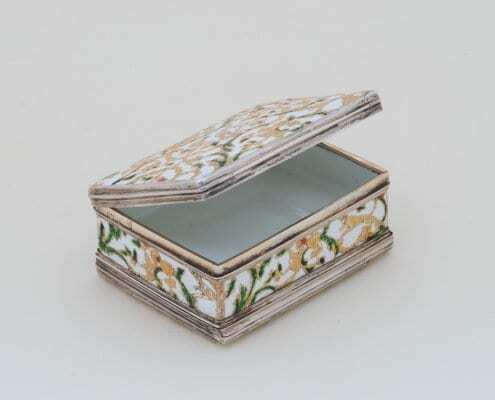 In the early eighteenth century, French snuff boxes (tabatières) made of gold and enamel or of other precious materials, were quite fashionably in Germany. These were mostly used for the storage of snuff tobacco, but also of powder, pills and bonbons. The ascent to power of Frederick the Great (1712-86) meant soon a restriction to their import from France. The goal was to encourage the local production of such wares. 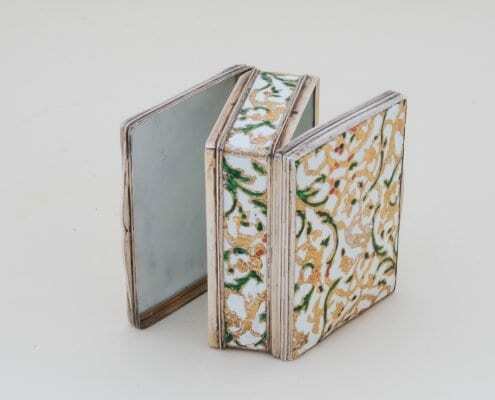 Frederick was himself a great collector and user of such snuff boxes, exactly like Heinrich von Brühl (1700-63), the head of the Meissen Porcelain Manufactory. The production of luxurious wares in Berlin of the eighteenth century was strongly influenced by Parisian examples. A secure attribution of enamel boxes to a specific workshop in Berlin is sometimes difficult, due to the lack of marks or signatures. According to latest research, the hypothesis has been expressed that many enamel parts were made in Berlin and sold in Paris, where they were finally mounted and marked. 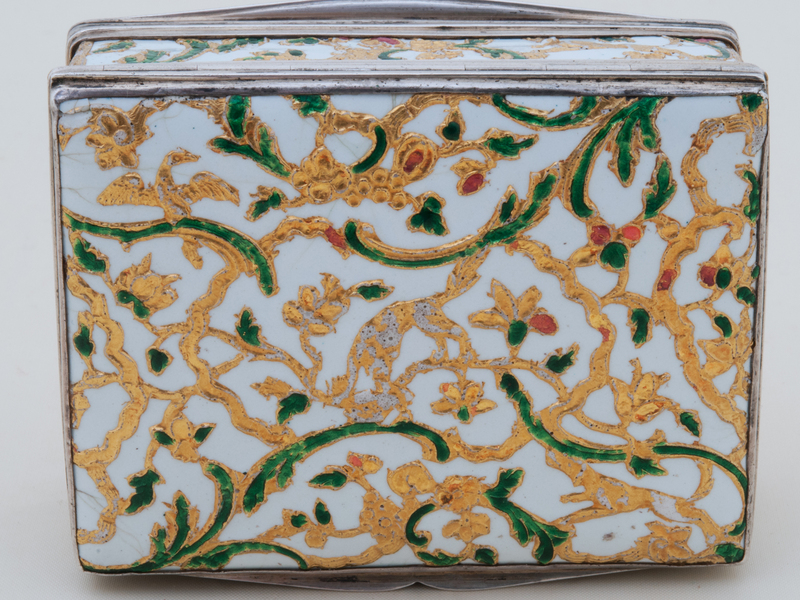 On this matter, compare two boxes with white enamel and gold foil applications in the Metropolitan Museum of Art, from the Robert Lehman Collection (and The Robert Lehman Collection 2012, cat. no. 72-73/p. 154-155). For further comparable objects of the same period, made in Berlin workshops, see for instance in the collections of the MAK – Österreichisches Museum für angewandte Kunst: http://sammlung.mak.at/sammlung_online?id=collect-27234. Steingräber, Erich, ‚Email’ In: Reallexikon zur Deutschen Kunstgeschichte, Bd. V (1959), Sp. 1–65; in: RDK Labor, URL: http://www.rdklabor.de/w/?oldid=93187 [25.05.2017].